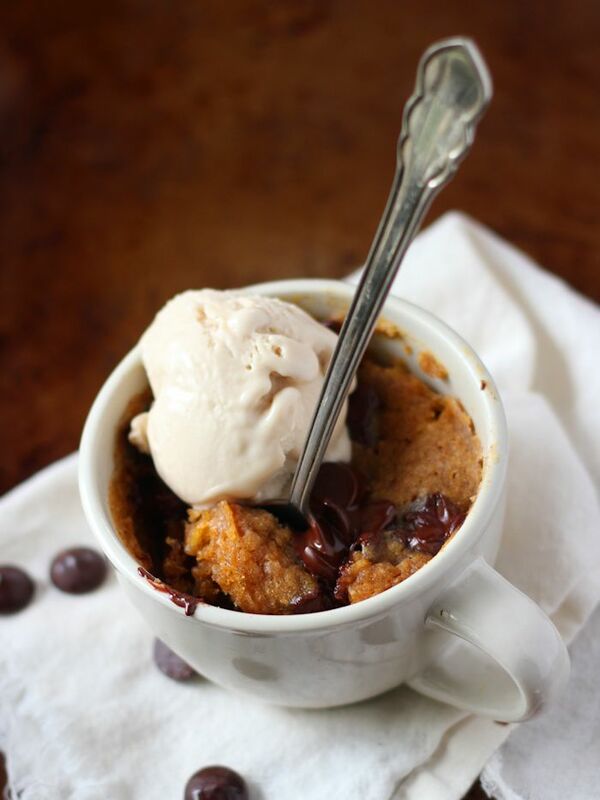 You’re just three minutes away from this decadent, chocolate chip studded, vegan vanilla ice cream topped, single-serving pumpkin mug cake! I think it’s safe to say that I generally eat pretty healthy. However, when I’ve got that hankering, I have an uncanny ability to produce something sweet out of thin air. My husband was amazed by this when we first got together. …pretty much anything can happen. Chocolate chip topped peanut butter by the spoonful. Grilled almond butter and mango sandwiches. Ritz crackers topped with maple syrup sweetened almond butter. Sesame chocolate banana soft serve. I didn’t invent that last one. I’ve known about these things for a while, and unfortunately, this isn’t the kind of thing you can just unlearn. You’re forever stuck with the knowledge that there’s cake available at all times. Once fall hits I start cracking open cans of pumpkin puree like crazy, and often I don’t use a whole can at once. 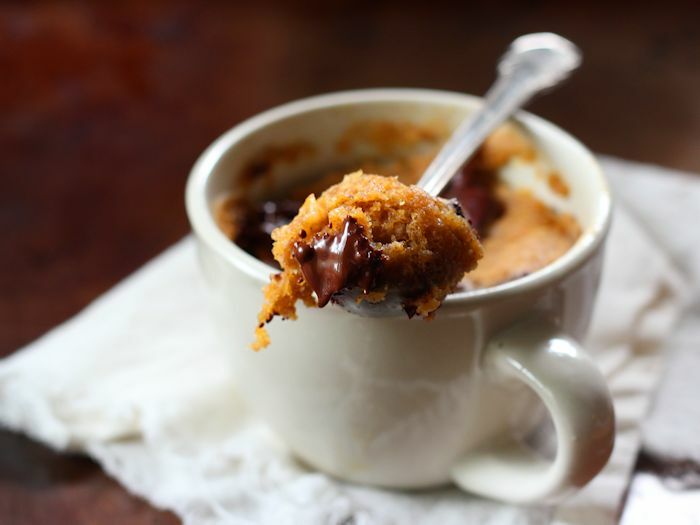 Mug cake is the perfect excuse to use up 1.5 tablespoons of that leftover pumpkin puree. You really don’t need an excuse though. This sucker takes just about three minutes to whip up. A few spoonfuls of flour, baking powder, spices and a pinch of salt. Then non-dairy milk, maple syrup, oil, pumpkin puree. Chocolate chips go in last. Stir it up, zap for a minute and dig in. Preferably top it with a scoop of dairy-free ice cream, but that’s your call. Microwave ovens vary in power, so you may need to cook yours a bit more than one minute. If it’s not cooked after the first minute, zap it again in 30 second increments. Be careful not to get your coconut oil too hot when melting it. It can heat up the batter and cause your chips to melt! Wondering where to find vegan chocolate chips? Try Enjoy Life brand! Some regular supermarkets carry them, and most places like whole foods do. And of course you can get them on Amazon. Will fresh pumpkin work for this? Yes, but you have to roast and puree it. Try this method! 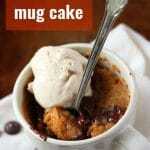 Just to prove how quick and easy this mug cake is to make, I went and created a video! 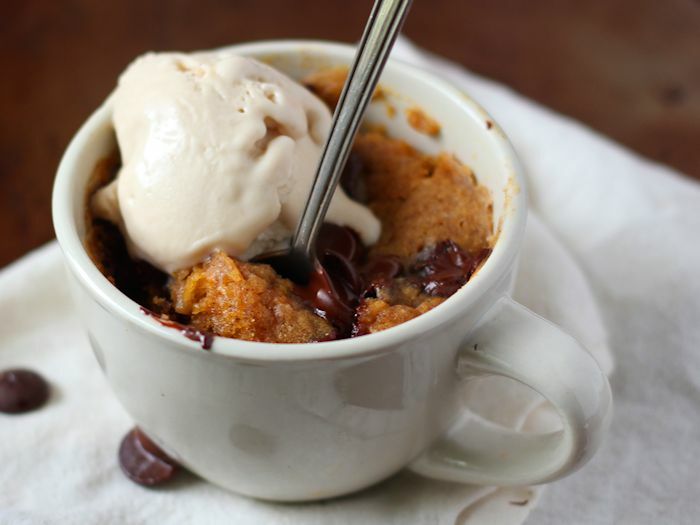 You're just three minutes away from this decadent, chocolate chip studded, vegan vanilla ice cream topped, single-serving pumpkin mug cake. 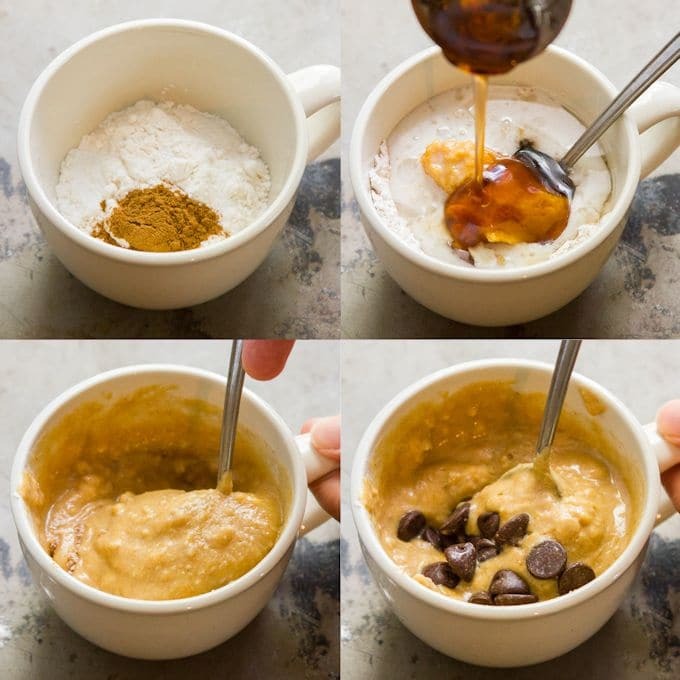 Stir the flour, pumpkin pie spice, baking powder and salt together in medium-sized coffee mug. Add the maple syrup, milk, pumpkin puree, and coconut oil. Microwave for 60 seconds. If it doesn't look done after 60 seconds, zap it for another thirty seconds. Serve with a spoon and optionally with a scoop of vegan vanilla ice cream. You really don’t need an excuse to use up excess pumpkin!!!!!!!! Yay! I’ve got some apple sauce in the fridge right now – I’ll have to give that a try. Thanks Kelly! I was wondering about that. Thank you. Will 100% cacao chips work, or do you think it will be too bitter?